Back before he became an Oscar-winning “national treasure”, Tom Hanks made a lot of potentially cheesy comedies. Into that category falls 1989’s The ‘Burbs, an effort from Gremlins director Joe Dante. Ray Peterson (Hanks) chooses to enjoy a “staycation” at his suburban home. He finds his idyll interrupted when an odd new family moves in next door. Curiosity piqued, Ray decides to investigate. Against the wishes of his wife Carol (Carrie Fisher), Ray partners with like-minded neighbors to find out the truth behind the spooky new residents. ’Burbs falls into that great morass of movies I suspect I saw decades ago but that quickly departed my memory. Given the involvement of Hanks and Dante, it seems like something I’d have watched, but if so, my fast-dying brain cells lost any recollection of the event. As noted earlier, Hanks found himself in a lot of fairly forgettable comedies back in the 1980s, for he didn’t really raise to “A”-list status until he gained his first Oscar for 1993’s Philadelphia. Paired with the commercial and critical success of 1994’s Forrest Gump, Hanks would soon enjoy the ability to pick and choose his roles with a presumably selective eye. 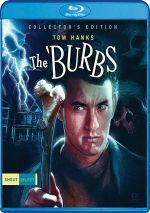 ’Burbs feels like the kind of part Hanks took because he didn’t get a lot of great offers. There’s a sense that he’s spinning wheels here, as ’Burbs offers the kind of unchallenging role that would soon seem beneath Hanks. Actually, coming off Hanks’ Oscar-nominated work in 1988’s Big, something like ’Burbs probably already felt that way to the actor, and his flat performance adds credence to that belief. Hanks earned fame due to his natural charm and charisma, qualities wholly absent from his turn as Ray. Honestly, Hanks seems bored throughout ’Burbs, as he brings none of his usual personality to the role. He sleepwalks through the film and fails to bring life to the character. None of his co-stars elevate the material, either, and ’Burbs wholly wastes Fisher on an anonymous part. Bruce Dern overacts a storm and others fall flat, too. And then there’s Rick Ducommun. Originally a stand-up comic, he lost to Brad Garrett on Star Search and never caught up with his competitor. Garrett went on to a pretty decent career, while Ducommun peaked as the briefly-seen electrical worker in Die Hard. There’s a reason Ducommun didn’t become a star: he wasn’t very talented. His grating work as Ray’s nosy neighbor becomes a low point in a movie full of low points. Though I’d never consider director Joe Dante to be a great filmmaker, he did good work over the years. He book-ended ’Burbs with 1988’s Innerspace and 1990’s Gremlins 2, movies I enjoy, so I expected ’Burbs would match up with those. It doesn’t, as it provides a painfully dull experience. The characters lack much of interest, and the story follows trite paths that fail to move in memorable directions. For a comedy-thriller, ’Burbs seems woefully light on laughs or scares. If a single funny moment appeared, I missed it, and I couldn’t find anything even vaguely intriguing about the story. Sluggish, pointless and dull, ’Burbs becomes a real dud. The ‘Burbs appears in an aspect ratio of approximately 1.85:1 on this Blu-ray Disc. This became a watchable but lackluster presentation. Sharpness was adequate but inconsistent. Most shots offered fairly positive delineation, but bouts of mild softness occurred as well. I saw no jagged edges or moiré effects, and edge haloes remained absent. Print flaws were a minor concern, but I did see a handful of small specks. The palette of ’Burbs leaned a bit blue – and a little pale. The colors occasionally showed reasonably good vivacity, but they often came across as a little thin. Blacks were mostly dark and firm, and low-light shots offered reasonable clarity. This felt like a pretty average image. Similar feelings greeted the decent DTS-HD MA stereo soundtrack of ’Burbs, as its audio quality seemed dated but fine. Music showed positive stereo presence, while effects offered decent breadth and movement to the sides, but the mix often felt fairly monaural. Speech appeared reasonably natural and concise, with minimal edginess. Some iffy looping appeared but that wasn’t a substantial issue. Music presented more than adequate range and depth, and effects showed good clarity and accuracy. Nothing here excelled, but the soundtrack held up well enough. This “Collector’s Edition” comes with a reasonable selection of supplements, and we open with an audio commentary from screenwriter Dana Olsen. Paired with moderator Calum Waddell, we find a running, screen-specific look at story and characters, cast and performances, sets and connected domains. Though technically “screen-specific”, this track often acts more as a long interview. While Olsen and Waddell sporadically discuss the on-screen material, they usually simply chat about the movie and aspects of Olsen’s work. That works fine for the most part, as we learn a fair amount about ’Burbs - albeit in a less than concise manner, as the chat tends to meander somewhat. Still, it gives us a pretty good view of the film and should work for fans. A documentary called There Goes the Neighborhood runs one hour, six minutes, 32 seconds. 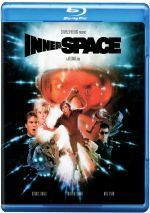 The program provides notes from director Joe Dante, director of photography Robert M. Stevens, production designer James H. Spencer, and actors Corey Feldman, Courtney Gains and Wendy Schaal. We learn how the various parties came onto the project, photography and color design, sets and shooting on the Universal lot, cast and performances, music, story/character areas, and the movie’s release/reception. “Goes” suffers from a disjointed nature, as it leaps from one topic to another without much clarity. Still, it throws out a good number of movie-related insights, so it works well despite the messy structure. A few more video features arrive, and we locate an Interview with Director Joe Dante. In this 18-minute, 36-second chat, Dante covers how he came onto the project, cast and performances, music, reviews and legacy. This piece uses the same session featured in “Goes”, and some of the same comments appear. Despite that repetition, Dante gives us enough new info to make this a useful program. Next comes an Interview with Photographer John Hora. This reel runs 10 minutes, 57 seconds and provides Hora’s thoughts about his relationship with Dante and his cinematographic work on ’Burbs. Hora delivers a good array of memories. During a nine-minute, 53-second Interview with Film Editor Marshall Harvey. He talks about his connection to Dante and editing topics to do with ’Burbs. We find another informative chat here. Of particular interest to fans, we get an Original Workprint of The ‘Burbs. It lasts 1:45:57 – opposed to the released film’s 1:41:41 – so it comes with a variety of changes. Taken from a videotape, picture and sound quality seem rough to say the least, but this still acts as a cool addition to the package. An Alternate Ending takes up seven minutes, 21 seconds. This wraps up the film in a much less wacky and action-oriented way than the theatrical release. Note that this is the same ending found on the “Workprint”. In addition to the film’s trailer, we finish with two Galleries. These cover “Behind-the-Scenes” (63 images) and “Stills/Posters” (83). Both offer decent collections of shots. Apparently The ‘Burbs gained a cult following over the last few decades, but I can’t figure out why. Slow, unfunny and witless, the movie lacks anything to make it enjoyable. The Blu-ray brings us acceptable picture and audio along with a nice array of bonus materials. While the film leaves me cold, fans will feel happy with this release.